Discussion in 'SEO - Packages' started by LukaB, Sep 8, 2016. Q: Does AuraRank Elite work on aged and new sites? A: Absolutely. Our SEO is powerful no matter what. Q: How many URL's and Keywords can I use? A: 3 URL’s and 3 Keywords are preferred. We also add many keywords to diversify your plan such as “click here” and “source” in addition to our 9 different anchor types. Q: What kind of sites do you accept? A: We accept all niches including gambling and adult. Q: What happens if my links die off? A: It’s 100% natural for links to die during any campaign – which is why we over-deliver on the number of links. You’re also backed by our 90-Day Link Replacement Guarantee! Hello BHW friends - it seems that I finally have an imposter. Beware of this, and please report or PM any further activity from imposters to the community. Luka provided his top level package for the review, all work was completed on time, to spec with no issues at all. Serpbook.com even shows a ranking increase in what is a very short amount of time since the work was finished. The report delivered was very detailed and super easy to follow. I was impressed by the service from start to finish. Mod Edit 21/05/17: Luka has been offering users extra links in return for them leaving a review on this thread. From what I can see no users have disclosed they have received the links in return for the review. Please keep this in mind when reading reviews within the thread. Thought I'd leave a review. I had a new site and purchased the Premium package, about 6-8 weeks after the work was completed, my site finally stabilized from all the G dancing, and is now in 1st spot for 4 different keywords, I am very pleased and will definitely be purchasing new orders real soon, thanks for the help Luka. Now into my third month of using this service. All my terms are on the first page. Highly recommend this service, unless you are in the same niche as me!!! Luka offers great customer service and the links that they create are superb and i cant speak highly enough. I will be using them for hopefully a long time! Roll on the rankings! okay... Here's where I'm at. When I first started this, I had several competitive keywords that were ranking on the first page of Google. I was doing pretty well but just could not get above some of the big boy sites that dominated the listings. In my field, you don't get sales at #5, #6, etc. You must be in the top 4. Ran across this listing and figured I'd give it a try. Spoke with them by email prior to ordering and they said their service would work perfect for my needs. I figured, "okay... sure... I'd be happy with going up one notch." Slowly but surely over the past month My listings have jumped around a bit but tonight I am sitting on #2 for a primary keyword that I felt was impossible to dominate... A month ago, I think I was somewhere around #9 or #10. This is simply amazing. lol Thank you!!!! Saw great results for one of my new niche sites. The only other method I did was rebranding with two websites together with AuraRank so it definitely had to help. And this is just through the Light package, I've just ordered a new package (Standard) for the same website and am hoping to get #9 and #4 to even better rankings together with another keyword which is 9,100 but I'm not expecting much movement there as it's currently at #29 but hopefully we will see it creep into the top 15 or so. Also, I've ordered another light package for another site that I'm hoping to see movement for as I haven't been able to move this site for a while now. Hoping this will help but not going to be surprised if it doesn't. P.S: The first site I've ran through AuraRank has already made its return back x5 in over a month, definitely worth the investment for the diversification that this service provides. My main keyword moved from #21 to spot #3. I Think i see more climbings soon , Fantastic, i will do 3-4 orders per month with them! 5 stars! I ordered a "lite" package for a local seo client of mine. He didn't have much of a budget but I wanted to help him get started with some 1-time link building. This little package packs a punch. It took a page-2 listed local service business site to top 3 for his major keywords. Not only that...but I see lots of the Tier 1 properties ranked high also. The content is written so well that these properties can actually drive traffic through the tier 1 properties. Luka won't let you down. Solid Service. Highly recommended. I was OP's client a while back ago. Bought the Standard Package and I am here to drop him a review for his service. I'd like to point out a few things about OP's service. It is AWWWSOMMEE! I saw HUGE, HUGE SERP rises after using his service and it stayed on first page! From #nowhere to #5. My keyword competition is medium and has around 9,000+ monthly searches. OP was fast in response and delivery. No hassles at all. To those who are still on the fence, think no more! Jump IN! If you're serious in Internet marketing, you'd know this service is a must to rank on Google search engine. P/S: Do I get a +rep for my great feedback? Anyway, thank you OP! Quick Review of the service. Purchased two different 'Standard' packages. Before working with Aurarank, my listings would just jump all over Google (#12 one day #8 the next, #15 the following day). I was usually in the top 10 for my keywords, but in my industry anything higher than #4 doesn't eat. Since signing up with Aurarank, all of my promoted coupon offers have moved to the top #5. In fact, All but one of them is in the top #3. Results are absolutely not overnight but it doesn't take too long at all to see progress. Most of my keywords are not 'low competition' -- they are mid to high so I am very impressed. In the next day or so, you'll see another order from me. I have a few more URLs that need a little kick in the rear end. That's Awesome. My traffic has tripled 3x thanks to you. Im really excited to finally start making some money on this site. OT, im gonna need some advice from you about another website. Ill hit you up on skype later. i had a big penalizzation at start of 2017, every week my SEO traffic dropped down and the tranding never changed. 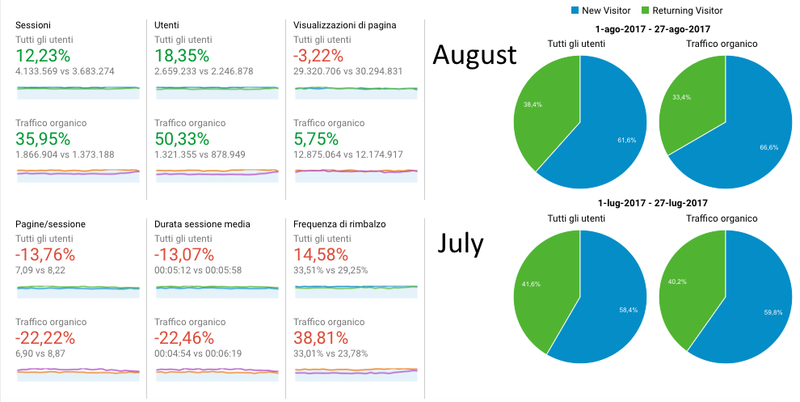 But a couple of months after bought Aura the tranding is changed now my keywords returned to first page and i had in the last month 2.180.668 session from SEO traffic!!! Just purchased, as usual love doing business with Luka, his a great guy and means well. This package is great for a new site! After penguin 2.0, i was very upset and looking for SEO support and found this service, and after going through all review i finally put my faith on it and WowoohOO!! after 1.5 month, my site is back on top, page 3 to page 1 and on top #5 for my main traffic keyword !!!!! really recommend this service!! A+ and 10 out of 10 for the support!!!!! Work is still being completed but already I've moved up from Page 2 to position #7 on Page 1. I'm confident this will improve as the service completes and links get indexed. Great service. Definitely will try again. My keyword from #26 position went to #5 for a month. It was medium competitive. Luka was kind enough to give me a review. I gave him a site with some unique content that I haven't done ANY SEO on for many months. Two of the keywords went from page 2 to NUMBER 1. These are low volume keywords, but pretty high competition. There are 100 Mil/yr companies who would like to rank for these terms. Communication is excellent, and I'm VERY impressed with the rank improvement so far! Updated Review: One of my keywords hit #1. Thanks Luka! 1.5 weeks in and I just got my first order for product!!!! I will update with details a little later. First off let me say that Luka is always available to answer questions (some of which I probably should have known). I wish I could offer my customers that kind of support. Second, I purchased 10 days ago and have already gone up more than 30 positions for some keywords that have no other links built to them, at all. Keywords that were not submitted to the campaign are now ranking and climbing slowly but surely. I don't mean to scare anyone, but this cant be legit! Eagerly awaiting my report so I can purchase another round. Thanks Luka. Just got my order finished for a Lite package! Wow, this man does an amazing job. I saw great movement on my main keyword from #26 to #5. I have never seen better results with any other service. I knew when I first spoke to Luka that he'd be the man for the job, he will guide and answer any questions that you might have at any time. I've even started recommending him to a few others because of the value he keeps on giving! Will definitely order again and I recommend others that are interested in this service to go ahead and order, because people like Luka is hard to find in such a big industry as this one. Many thanks Luka, I'll talk to you soon! I've said this before, and I'll say it again. I've bought A LOT of work from A TON of suppliers on WF and Luka and his AuraRank product works great, every time. Do it. Buy it. Love it. Embrace it. Even just for the vanity, you should do it. Update: My keyword jumped to #6 from around #20. Great service, highly recommended! Just placed another order. Highly recommend AuraRank for people who needs an excellent SEO service. In AuraRank, you will NOT ONLY get good support from Luka personally, the result from this service is coming fast and the rank goes up and up in an obvious speed. Aurarank is already one of my favorite services on BHW. I have placed several orders and plan to send all my newest projects to Luka. I am impressed with the customer service and ease of following my campaigns using the panel. I checked the quality of the backlinks and I am excited to see the long-term effect on rankings! Short term - SERPs IMPROVED! Just started a new campaign with ONLY Aurarank links, will keep you all posted! I have ordered Aura Rank package for non-english very competitve keywords. My website got huge jump in SERPS. I am very satisfied with achived positions. Luke is great guy and communication was very good, we got some reports issue that was quickly and smoothly solved. I was given a review and while it is still too early to determine everything, I do appreciate the time Luka spent with me on Skype chat. We have spent hours discussing strategy and on-site SEO (which I was lacking). He also recommended some things that had nothing to do with SEO which affected my site that I would have never thought of. His knowledge coupled with his experience and fresh outlook have really made a difference. If you own a website that you are having some trouble with in SERPS, spend a few minutes with this guy and get his opinion/advice, regardless if you get his service or not. Hi Luka, my one month of the standard package has come to an end and I have been very impressed with the results. One of my keywords which took a battering with the latest Google update and was lingering on the 10th page but is now climbing up and is already on the 5th page after one month. I would like to take out the recurring package now do I have to do anything different with purchasing as you already have my details? I would like to change 2 of the keywords however, on hindsight. When I Order for a service, I give an HONEST review! So that is what am going to give here. It took one of my KW that has 135k search per month from #35 to #6! Yeah! That is how powerful Aurarank is. But there is a little problem. Over 70% of the links has not been indexed yet. And it is well over a month. Please do something about this. Am sure if 85%+ of the links are indexed and crawled. The results will be WOW! Note: This is a very competitive niche, and I have bought over 3 SEO services and nothing happened. But with just a strike from AR. Am seeing results already. Other keywords are also in the top 10. I will be placing another order very soon. A compact review of the 6 Packages i ordered! Yes 6 packages, after the first package results i had to make sure i made the most of this. First package hit no1 literally a few days ago but shot from 11 - 3 within 2 weeks of order - Medium Competition. Second package 2 keywords were stuck at 12-15 for months even when i pressed on with other packages. Aura rank pushed them 2 up to 3- 4 and i know there gonna hit no1 when links index. Medium comp. Third package is at number 3 from number 11, same story wouldn't budge but these links certainly did that, and I'm expecting number 1 spot. Fourth package - In all honesty hasn't taken effect yet, but was only completed a few days ago. I have full confidence that the same results should follow suit. Fifth and Sixth package are new orders so can't comment yet but for sure if its like any of the others should be similar results. They are medium competition also. Its been a pleasure to work with Luka at aura rank and his team have great things to come for sure. These are my go to guys now for this type of work! LukaB has offered me the best support so far and I have never been disappointed with any issues for sales and pre-sales 24/7. This service is all done manually and I know that I will be getting excellent SERP results. I will update with screenshots soon!! I have done business with Luka for 3 months and up to this moment, this service is still recommended. Ordered a lite package 2 weeks ago. Luka finished everything yesterday. Was on page 7 @ spot 75 and now sitting on page 2. Spot 11 for local search. Expecting first page within the next few weeks. Excellent service and quick to reply. Will use your service again! Thanks Luka! I ordered the Premium Package + PBNs and Luka finished it a few weeks ago. Communication with Luka was great, he was patient and answered all of my questions quickly. He kept me updated frequently and finished my package on time. My site is now ranking great and I will definitely be using Lukas services again in the future. HOLY CRAP! Its only been 1 week and one of my keywords is on the 2nd page. Keywords targeted are now #4 and #10. Other keywords move as well. I got my final report yesterday. Although ranking improvements haven't kicked in yet, I can confidently say that this is one of the most responsive and respectful sellers on BHW. This is my third month of Aurarank, just thought I would share for those on the fence. Keep up the good work, Luka. Fantastic service again. Looking forward to my next order. Thanks Luka! I usually don't write reviews, however I feel like this service deserves it the most out of every single service on this website. I have been using AuraRank since the first version few years ago, and I have been a loyal customer ever since. I have no idea what these guys do to your site, but it must be magic of some sort. They have helped me rank dousins of websites throughout the years, and continue to amaze me every day. I thought that services usually get worse as time flies (from previous experience here on this site), however these guys do the exact opposite. Every time I use them, they continue to surprise me. I had a website stuck on rank 3 for a long time on a very competitive keyword (like EXTREME competition). And with stuck, I mean it's been #3 for about 2 years, no joke. If any movement happens, it is purely because of recent actions. 1 package in with AuraRank and I jumped to #2, and I bought another 2 weeks ago, and it is already jumping back and forth to #1. I hope it sticks soon. Thank you so much for your great service LukaB, and you have a customer for life now. Let me just say that Lukas communication has been top notch. Im online a lot and on BHW a decent bit but Luka is always fast at responding on skype and BHW. I wonder if the man ever sleeps, lol. Thanks for great communication mate, make my life simple. Just got my final report from AuraRank and I have to say I am VERY impressed. Luka was a pleasure to work with from the beginning and was very professional and honest about what he felt he could achieve for my website in terms of rankings. The quality of the work itself was beyond what I expected. Luka and his team built a ton of high-quality, niche-relevant links and there were even well-written articles pertaining to my specific niche. I got the Platinum package, and the work was just completed, so I'm still waiting to see the final results of this package on my rankings, but the Google dance has already begun and I'm looking forward to seeing where we end up. I'm very confident because of the number and the quality of links that were built. I would absolutely hire Luka again and will give an updated review as soon as I see the final results. Yo Luka, I gotta say, I was at first somewhat unsure if Aura Rank was going to work. As it was being worked on, our rankings started slowly increasing. 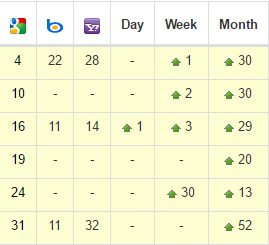 After the large Google update a week or so ago, our rankings skyrocketed. Needless to say, I'm a believer and am submitting an order for the Platinum package. Thanks! Also just looked at your recent client images. Looks more like a product of the update that happened on a rollout from Thurs-Sun. Is there any review copy available? Thx! Your 20% OFF Coupon has been PMd you you. On the SERP movements above you can see positive movements happening before Thur-Sun . Yep we have a 20% OFF coupon. PM'd you. We'll be more than glad to have you Hawkster! Definitely will take a discount coupon as LukaB is one of the best out there! Coupon if available. This looks great. How does this differ from your other SEO thread? Thank you for the kind words, much appreciated. If you are referring to my other currently active service, that is for $500+/mo at minimum. However we will soon be closing doors for that one as the spots are limited. With AuraRank, we can take as many as possible. 1 More 20% OFF Coupon Code Available! Claim it before it's gone! Could I have a coupon please? If you have a coupon, I will take one! 20% Coupons are Gone - Thank you for all your orders! 4 More 15% OFF Coupons available - Grab em while you can! Looks like a wicked service. Going to order when I have a project ready for it. Looking forward to having you on board David! 5x 20% Off are Gone! 3 More 15% OFF Coupons Left - Claim Yours Before They're Gone!